Driven by the belief that all homeowners are truly “green” at heart (or can be), our goal is to increase your at-home energy efficiency with upgraded windows at a great discount. 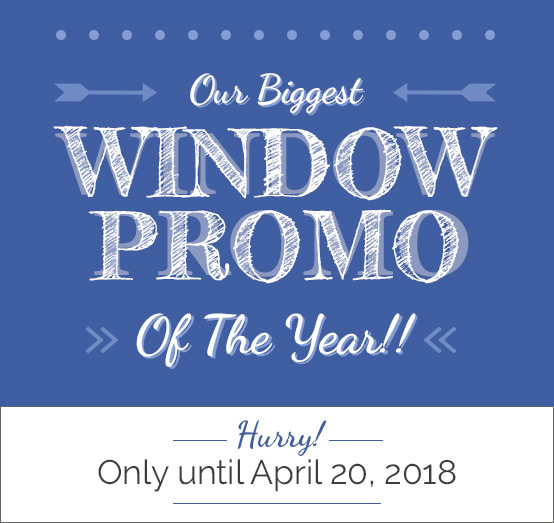 Our biggest window promo of the year! We offer a cost-effective, low-hassle solution to the frustrating problem of foggy windows—fog that’s neither on the inside or outside of your window, but the condensation that builds in between your panes. Foggy windows do not mean that you have to replace them, but it is a problem that must be eliminated in order to prevent further damage and costly repairs. Our process solves window condensation problems at a fraction of the cost of window replacement without having to remove the unit and we back it with a 10 year, 100% money back guarantee! *TERMS & CONDITIONS Limited time offer. The signed contract must be dated and the deposit received on or before April 20, 2018 to qualify for the PVC Window or Fog-Out Repair promotions. These promotions are applicable to renovations only and cannot be combined with any other promotions or discounts. Go-Green Windows & Doors is an approved contractor for Energy Efficiency Alberta. Save up to $1500 Upgrade to new, ENERGY STAR® triple pane, low-e, argon windows at valuable savings—on the purchase, installation, and your ongoing energy bills. Interested in being the first to know about new Go-Green offers and promotions? Join our mailing list today, and we’ll keep you informed as exciting new offers are released. Seniors’ Discount of 10% available year-round!